History, culture, business and leisure make London a unique and inspiring place to study. And with LSBU situated in its heart, what better base from which to explore? London was recently crowned 'best city in the world' and it's easy to see why. With so much to see, do, eat, drink and shop for you'll never be bored, and with great transport links and so many of the world's leading businesses located here, there are a wealth of opportunities to discover. The city is home to many historical landmarks that you'll recognise from postcards, films, music videos and more. Don't miss Big Ben, Piccadilly, and Tower Bridge, and make sure to catch a glimpse of the Royal Family and the changing of the guard at Buckingham Palace. 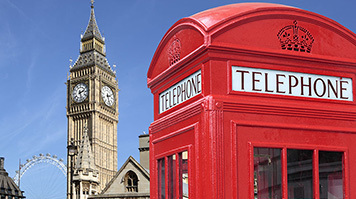 The city is a great mix of tradition and modernity; hop on a red London bus or jump in a black cab to take in the sights around Parliament and the River Thames, or crane your neck up at the towering skyscrapers of the financial district. It's not all brick, glass and concrete though; London is home to some of the world's finest urban parks, such as Hyde Park and Hampstead Heath, where the hustle and bustle of the city feels a world away. Thanks to its world city status, international companies and banks often choose to have their headquarters in London, which makes up one of the pillars of the global financial system along with New York and Tokyo. You'll also find every kind business in-between – London is a centre for law, fashion, the arts and technology too. Many of these employers provide opportunities such as networking events and interview training, which are often advertised through London universities themselves, while internships, work experience and graduate schemes are all on offer within the city. London thrives on its multi-ethnic and multi-lingual culture. Over 300 languages are spoken every day, and walking through the streets you'll spot a vast variety of people and cultures, and most importantly an endless choice of eating options! Events such as Notting Hill Carnival and Chinese New Year celebrate this diversity but also serve to bring London together in noisy and colourful street parties, and areas like Brick Lane showcase the best food the world has to offer. Sitting in the centre of all this is LSBU. Few city centre campuses in London are as compact as ours in the Elephant & Castle. On the border of the city's Zones 1 and 2 for public transport, we're minutes from the entertainment buzz of bars, restaurants and clubs, plus many of the city's world-renowned galleries, theatres, museums and attractions. Our main campus is a 10-minute walk from the famous centre of the arts, South Bank, and mainline stations such as London Waterloo and London Bridge, and a two-minute walk from Elephant & Castle Underground station. Stay in our halls of residence or nearby in private rented accommodation and you'll have the perfect base to explore the history and culture of this megacity.